Acoholic energy drinks contain a lot of sugar and flavoring. The difference is that this new generation of malt beverages also contains stimulants. 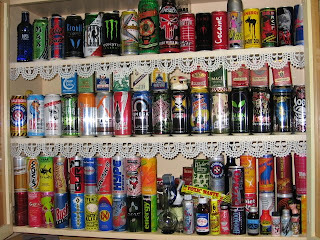 A typical can has about as much caffeine as a venti cup of Starbucks, along with additives like guarana and ginseng that can rev the central nervous system. Though flavored malt beverages make up less than 2% of alcohol servings in the U.S. The new alcoholic energy drinks have a further pull on the youth market: the promise that you can get drunk but still party all night because of the caffeine. Law-enforcement officials want tighter regulations on the drinks. Maryland Attorney General Douglas Gansler, a Democrat who is helping lead a national campaign against the beverages, calls them "disgusting." He says: "The caffeine is a stimulant that triggers the false impression that kids can drink more and still function normally. The kids won't recognize they are actually drunk...And then all of a sudden, over a short period of time, it goes Bam, and they're gone." Mixing alcohol, a depressant, with stimulants is nothing new. But alcoholic energy drinks are different because they are so obviously marketed to kids. Researchers conducted - Caffeine won't keep you from getting drunk. In fact, drinking caffeine with alcohol could be more dangerous than drinking alcohol alone, from a psychological perspective. One of the fascinating things about how humans process alcohol is that we involve our brains as well as our bodies: we have at least some capacity to overcome alcohol's effects by sheer force of will. Mark Fillmore, a psychologist at the University of Kentucky, has found that study volunteers who are warned that a certain alcoholic drink will highly impair their performance on a psychomotor test actually do better on the test than people who are given the same drink but no information about impairment. In other words, at least in a lab setting, those who are led to believe that they're about to get truly blotto end up not letting themselves get so blotto. They don't perform as well on their tests as sober people, but they perform a lot better than the average drinker. Alcohol functions in your body pretty much the same, whether you mix it with caffeine or not: you will be impaired. The problem is, you may not feel as impaired if caffeine is present. Clinical and Experimental Research found that people who drank energy drinks with alcohol felt better than those who drank only alcohol — the former group had significantly less dry mouth and headache. They also perceived their motor coordination to be better, even though it wasn't. So if your beverage of choice carries a silly name like Tilt, Bawls, Sparks or Rip it, you’re probably too young to drink anyway. 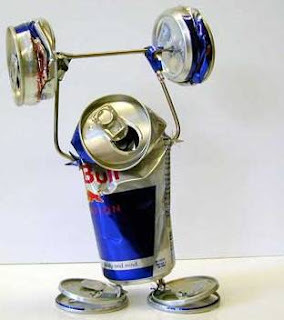 Stimulants for best energy drink is also same as in the alcoholic drinks.However, there is still a big difference for energy drinks can never get you drunk.